In the Elan Valley the second dam 'up-river' after Caban-coch doesn't really look like a dam at all. This is Garreg-ddu, which is sometimes called the 'submerged dam'. Garreg-ddu plays a more important part in providing a constant supply of water to Birmingham than you would guess. The part you can see above the normal water level, as in the photograph shown here, just looks like a narrow road bridge made of stone, with many arches. on glass, taken in 1901. 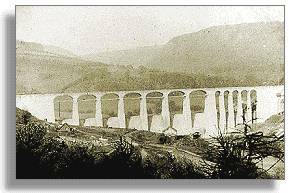 The water supply from the Elan Valley goes over 70 miles to Birmingham by a special pipeline called an 'aqueduct'. It travels all that way 'downhill' by gravity without being pumped, but to do that it has to start from a higher level than the reservoir at the far end. The water enters the aqueduct through a special valve tower just above this submerged dam. 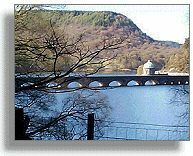 You can see this tower, called 'Foel Tower' beyond the bridge in the top photograph.The underwater dam does the job of keeping the Garreg-ddu Reservoir water level high enough to keep the flow going at all times.